These filters are used for filtration of 15-20 microns particle sizes. General air conditioning and air handling units etc are the areas where these filters used. The media used for these filters are metallic meshes either in stainless steel or galvanized iron type. 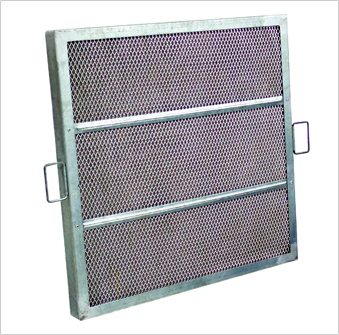 The material used for filter casing are mild steel, galvanized steel, aluminium or stainless steel. Casing design available are box type or flange type as per the requirement. Sizes not mentioned in the above list are also available on request. Efficiency : More than 90% down to 15 – 20 microns. Initial Pr.drop : Less than 5.0 mm wg to rated air flow. Final Pr.drop : 18 mm wg.